We are your truck repair specialist serving Savannah, GA and the Low Country. When it comes to driveshaft and hydraulic components, our experts have the knowledge and experience to design, install and perform truck repair work to meet all of your needs. Powertrain Inc. provides custom driveshaft, wetline kits, driveline and power take-offs. 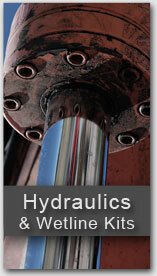 Call Powertrain, Inc. in Savannah for all of your drivetrain and mobile hydraulic needs.